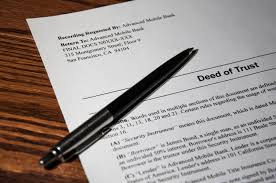 In the previous post we looked at Deeds of Trusts (“DOT”) and the borrower’s obligations related to the DOT. In this installment we will look at lender remedies and other forms of security instruments. While it is important to understand what is secured, it is equally important, if not more important to understand the lender’s remedies in the event of default. In the case of a DOT, remedies can take many forms, but in most situations the primary remedies are foreclosure of the collateral and specific performance for the imposition of a receiver. Foreclosure is the most commonly recognized remedy and is the remedy where the lender takes back the real property based upon some uncured default. That foreclosure can either be judicial or non-judicial. A non-judicial foreclosure is the power of sale foreclosure where a lender without court intervention forecloses on a specific piece of collateral. While this is the primary foreclosure method in a residential property it is not the primary method in a commercial context. A judicial foreclosure is the most common type of foreclosure in a commercial context for one primary reason – it creates the action which allows the lender to put a receiver in place to control the real property during the pendency of litigation. A receiver in the lending related litigation is the lender’s interim remedy. It is when control of the collateral is taken from the defaulting borrower and placed with a court appointed receiver that is usually selected by the lender during the pendency of a lawsuit. While California case law views the imposition of a receiver as a draconian remedy that should be reserved for situations when less invasive remedies are unavailable, the vast majority of commercial lending contracts now require the borrower to agree to an exclusive right of appointment of a receiver upon default and the California Civil Code in section 2938 mandates that where there is an assignment of rents provision and a receiver provision in a DOT, that the court is required to appoint the receiver upon the occurrence of default. Courts have some leeway in making these determinations but they are often tempered by the contractual provisions required by lenders. The other two ancillary security agreements are UCC-1 and hypothecation agreements. Typically in a UCC-1 filing, the lender is securing as collateral the personal property, inventory and equipment of the business as collateral for the loan. This is important in the business construct for the lender to ensure that if the borrower defaults on the loan that the lender has the ability to use a receiver to continue to operate the business until the default is resolved of the property is foreclosed upon. Additionally, you sometimes see in junior business debt or mezzanine deals where the lender takes a hypothecation of the business interest as collateral. As part of the securitization of the loan, the junior lender requires the borrower to pledge the shares of the company or membership interest in the company in favor of the lender so that if the borrower defaults the lender can take appropriate action to take control of the business. The last type of security agreement used in commercial deals on a regular basis is the personal or corporate guarantee. I will not spend much time on this topic at this point as it will be addressed in more detail in a separate article. But the basics of a guarantee are that somebody other than the borrower is also guaranteeing performance or collection on the note. Commercial loans are significantly more complex than your everyday run of the mill residential mortgage loans. They place far more requirements and restrictions on a borrower and it is important to understand how these documents work and are enforced. The theme remains the same, the lenders have multiple attorneys working on their loans, you should have at least one competent lawyer working on your behalf. For over 20 years, the attorneys of BPE Law Group, P.C. have been advising and representing business and property owners and investors in dealing with their legal needs. Check us out on the Web at: www.bpelaw.com. If you would like a consultation with us, please call our office at (916) 966-2260 or e-mail Keith Dunnagan at the above link.